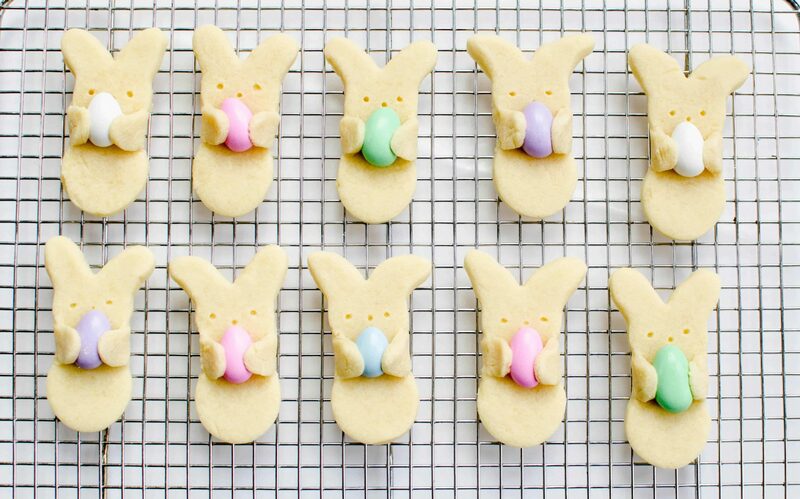 Make these adorable Easter bunny cookies that look like they’re carrying Easter eggs. 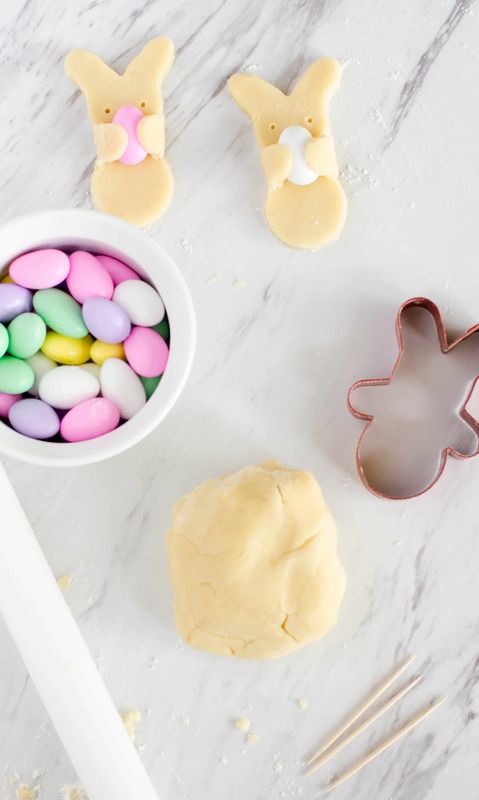 All you need is your favorite sugar cookie recipe, Jordan almonds, and a cookie cutter. Hello friends! Today I’m back with a cute treat for Easter. I’ve had these little bunnies in my mind for a few months now and I’m so glad I finally had a chance to make them and share them with you. 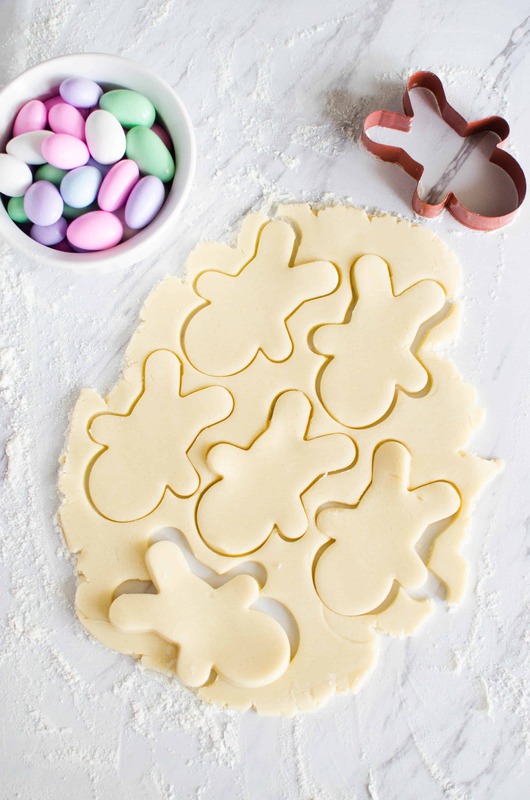 The main feature of these Easter bunny cookies is the little Easter “egg” that they carry. The egg is actually a Jordan almond, which I’ve always loved. They are a weakness of mine actually. In fact, when I first bought them for these cookies, I didn’t even make it out to my car when leaving the store before getting the package open and having a couple. Then, I went through two packs before I finally got around to making the cookies that I bought them for to begin with! But now, here we are. 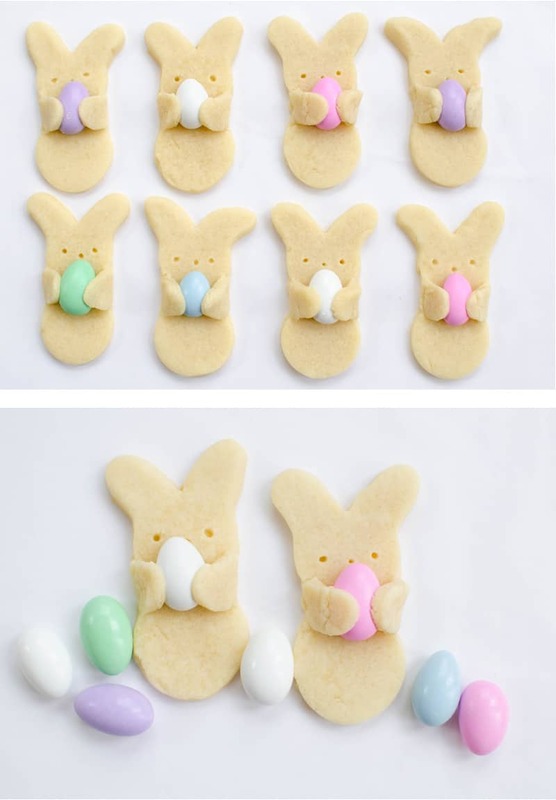 And we have adorable, Easter-egg-carrying bunny cookies. So, I’ll admit I wasn’t even sure if these cookies were going to work at first. Would the Jordan almonds melt in the oven? Would the little bunny hands stay holding the “eggs”? It turns out, everything worked perfectly with hardly any problems at all. A few of the almonds cracked while baking, but it was a very small number. And occasionally, a little bunny arm would pop up, but I found that there were a few tricks to help keep everything in place. *Use a sugar cookie recipe specifically for cut-out cookies. I used this one. Overall, I loved the flavor and the cookies definitely held their shape. But, the dough became more crumbly the more I worked with it. And, after baking, some of the cookies were more fragile than I would have liked and fell apart pretty easily. ** I was originally going to use the bunny from this Peeps cookie cutter, but it was really too big for this project. So, I made do with what I had, which was a gingerbread man cookie cutter. The shape was a pretty good match for a bunny, plus it already had the little arms for holding the eggs…yas! Roll your dough to about 1/8 to 1/4 inch thick. If it’s too thin it’ll fall apart too easily. Make sure you have plenty of flour on your surface to prevent sticking. 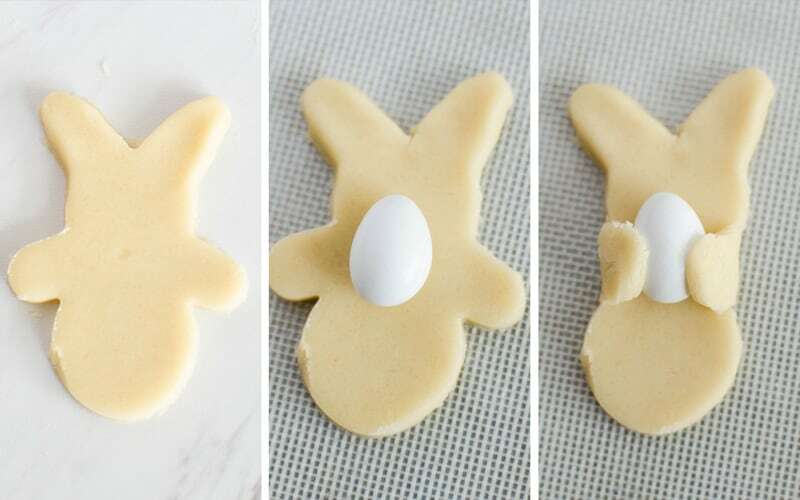 Use your cookie cutter to cut your bunny shapes out. Don’t worry, they might not look like bunnies yet, but they will! Once you have your shapes, pinch the legs so they aren’t as round and look more like bunny ears. Go ahead and move the cookies to your cookie sheet before you start adding the Jordan almonds. 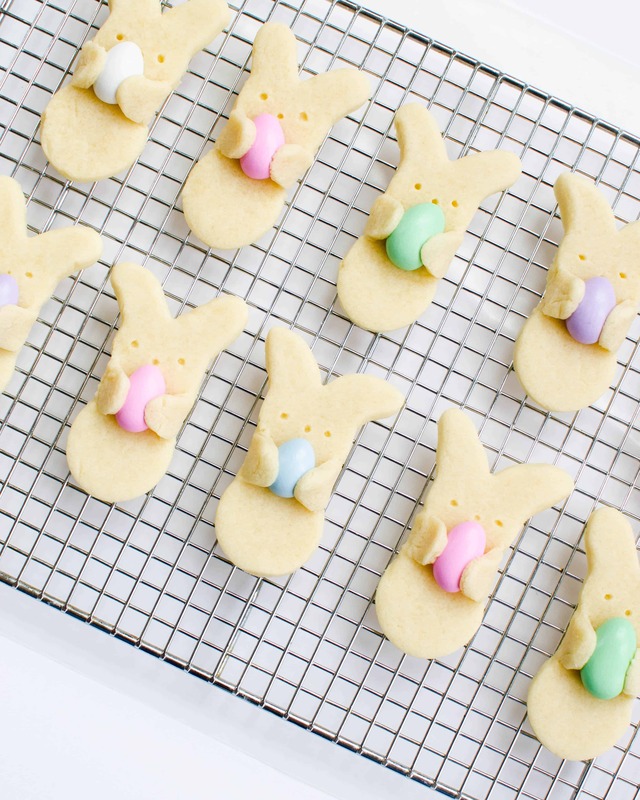 Once your bunnies are in place on the cookie sheet, you can add the candy and gently fold the arms over. If you press the arms into the Jordan almonds a little so they stick they’ll be less likely to pop off. You can also dab a tiny bit of water on the tips of the hands to make them stickier if they give you any problems. Use a toothpick to make a face on your bunnies, making sure to make the holes pretty deep. Bake according to your cookie recipe. I baked these little guys for 6 minutes and it was perfect. After making about 4 batches, I probably had 4 or 5 of the almonds crack during baking. I’m not sure why some cracked and some didn’t, but since it was only a few I didn’t worry about it too much. If you take your cookies out of the oven and see that some of the bunny arms have come off of the eggs, go ahead and push them back while they’re still warm. If you hold them onto the candy for a few seconds they should stick back with no problems. 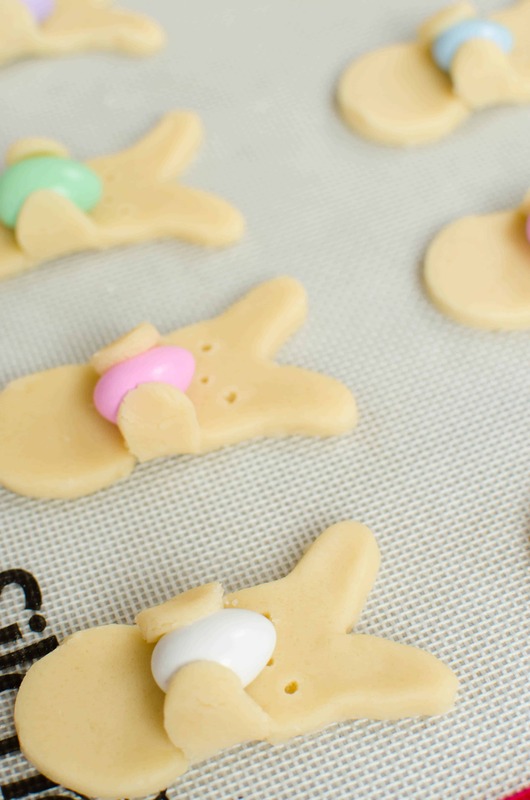 Now, let your bunnies cool on the cookie sheet for a few minutes before transferring them to a plate or cooling rack. If you try to move them too soon you’ll risk breaking them during transfer. Eat them immediately, or store in an air-tight container and eat within a few days. 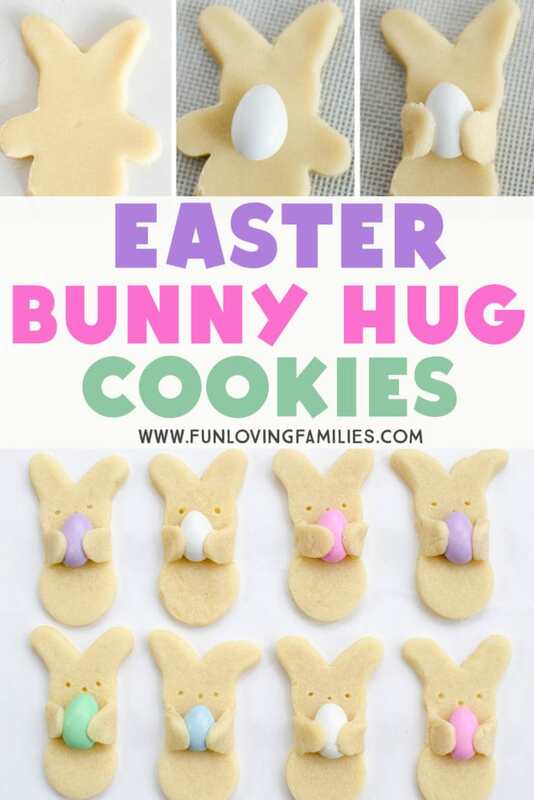 I’m still on the lookout for the perfect sugar cookie recipe to use with these Easter bunny cookies. If you make these with a different recipe and have good results, let me know which recipe you use in the comments so I can try it! Don’t forget to Pin this image to save this idea and share it with others! So adorable! I wonder if you could do this with the shelled Cadbury eggs without them melting? Thanks, Crystal! I’d be hesitant to use chocolate eggs, but it’d be really easy to give it a try and see. Let me know if you try it! Hi Sylvia! Wanted to update you that this has now been tried with the mini Cadburry Eggs! 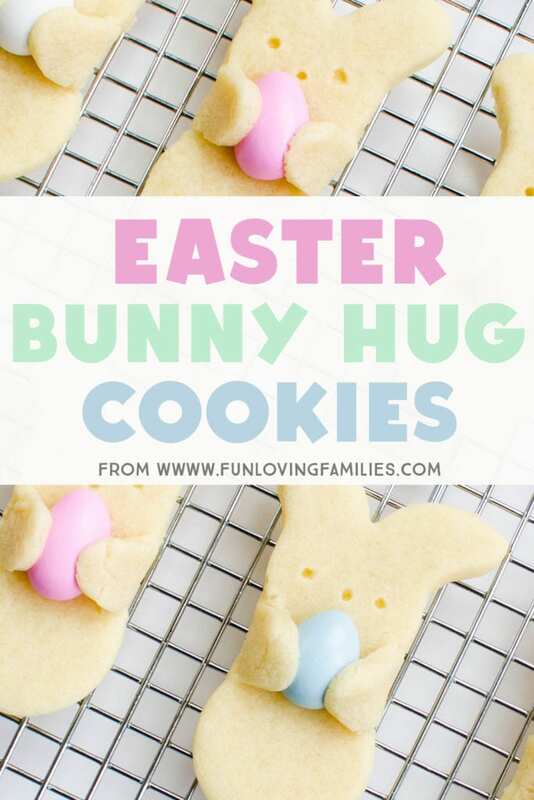 You can check out the video here: https://www.delish.com/cooking/a19537957/bunny-hug-cookies-video/ to see how they turned out. It looks like there was some cracking, but otherwise the eggs stayed in tact! Cute cookies and what a great idea! I do have a question though. I looked at all your pictures and you don’t show any that are baked. Did the ‘arm’s stay closed/wrapped holding the almond after they baked or did they pull apart? If so, how did you keep them closed? I’m so glad you like the cookies. Most of the images here are actually of the cookies post-baking. Any of the images that you see where the cookies are on the wire racks have been baked. The key is using a sugar cookie recipe that holds its shape really well and not over-baking. As far as keeping the arms holding onto the eggs, overall I didn’t have too much of an issue with it. Here are some things to try if your bunny arms aren’t cooperating: give them an extra little “smoosh” into the Jordan almonds before you put them in the oven. If they pop back up, add a tiny dab of water to make them a little sticky. Check for any arms that popped up during baking (I think this only happened to 2 or 3 of mine) and smoosh them back down onto the eggs as soon as they come out of the oven. I have to make some this week for a bunch of little ones, and I can’t wait to try this! I hope your little ones enjoy them! I wonder if anyone has tried coloring the cookie dough pastel colors?? What a fun idea! I haven’t see anybody try it that way, but if you do please let me know how they turn out. Thanks for chiming in with a fun twist on these cookies! Awesome! Yes, please let me know how it goes. Jelly beans will be so colorful! It went pretty well! The jellybeans are smaller so I was able to squeeze in a bunch, which was cute. I rolled my dough a little too thick so they spread quite a bit with the increased baking time… I would recommend rolling them quite thinly and chilling the cut-out shapes for a few minutes before popping them in the oven, but I had impatient toddlers helping. If you can keep baking time to under 6 minutes, the jelly beans shouldn’t be affected – I cooked mine for closer to 10 and they started to melt, although they hardened back up nicely after cooling and there was no colour bleeding on the sugar cookie 🙂 All in all, success! Looks great! I was looking for Easter cookie cutters and now i can just use my ginger man! Thx! Love the egg idea too! I made these with a TINY gingerbread man cookie cutter (1 1/2″-2″) and used peanut M&Ms rather than Jordan almonds. Worked GREAT! Oh, Sara…That sounds so stinking adorable! I’d love to see them. Do you have pictures of them anywhere?